Miss Happ Rockabilly and Pin Up Clothing: Cherry Baby! New Items now in store at Retrospective Cape Town. 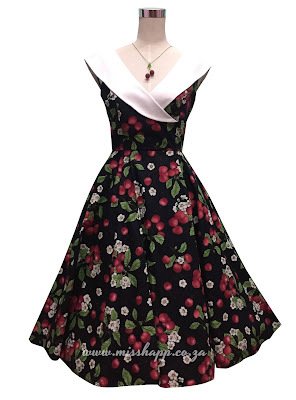 Cherry Baby! New Items now in store at Retrospective Cape Town. For all the ladies who have been waiting, you can now get our latest Nancy Strawberry print dress in our store! Sizes Small (8) - XLarge (14). Price is R1110.00. 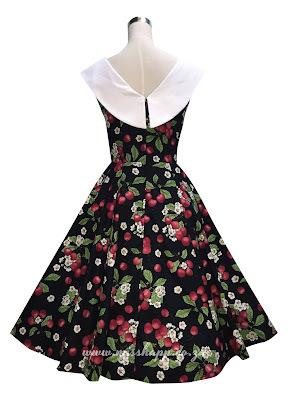 Perfect for that summer picnic in the park. Dress it down with flats or heels for a night out. And Looky here!! 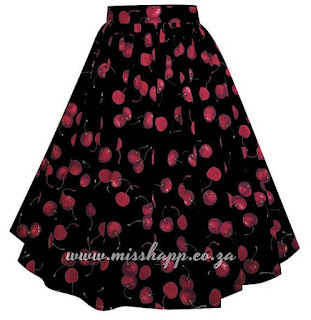 Our ever popular Cherry Starla Flared skirt is now restocked in sizes S - XLarge. Price R750.00. A great wardrobe staple!